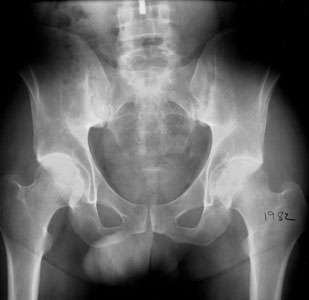 Peer Review Status: Internally Peer Reviewed An AP radiograph of the pelvis from 1975 shows that the sacroiliac joints are normal radiographically. 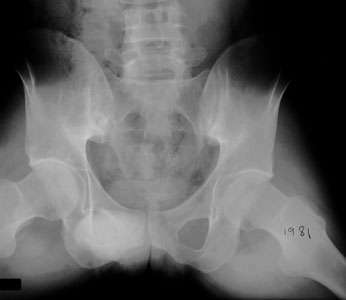 A subsequent radiograph in 1981 shows that there is irregularity of the sacroiliac joints, more so on the iliac side of the joint. This is due to the fact that the cartilage thickness of the ilium is less than that of the sacrum and hence bone erosions appear first on the iliac side. A follow-up radiograph in 1982 demonstrates that both the sacral and iliac sides of both sacroiliac joints show conspicuous erosion and sclerosis. The findings are characteristic of the symmetric seronegative spondylarthropathies, including ankylosing spondylitis and arthritis associated with inflammatory bowel disease.